ItemPDP00937 - Old Coast village. ItemPDP00939 - Base of very high leaning pole at Gitex on Nass River. Naas is an alternate spelling for Nass. Source of title proper: Title is in Carr's hand on lower right front. She has spelled NAAS which has been retained. Statements of responsibility: Signed Emily Carr on lower right front. Parallel titles and other title information: Parallel title inscribed in graphite in Carr's hand on upper left front. 1 watercolour: watercolour on paper; 76.5 cm x 50.0 cm. Archives code(s): PDP00935; Previously numbered as NC 135. 2001-2002. 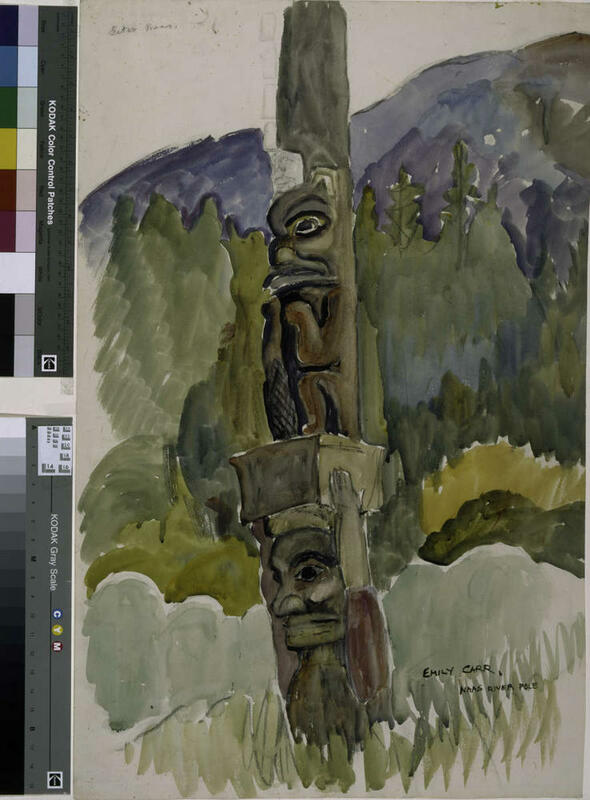 Emily Carr: Artist, Author, Eccentric, Genius. Royal British Columbia Museum, Victoria, BC.